Whether it’s your first home purchase or your fifth, buying a new home can be an exhausting process. There are so many bases to cover, it’s almost too easy to make missteps along the way. 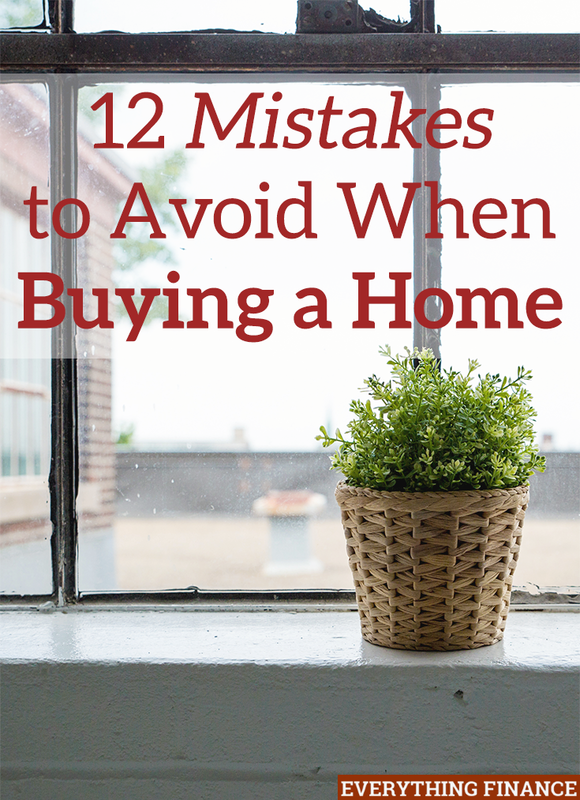 As a homeowner and a former mortgage banker, I’ve made my own home buying mistakes and seen countless other buyers do the same. If you do a little research ahead of time and create a personal checklist, you can avoid making these 12 mistakes when buying a home. Here’s what to watch out for and what to do instead! Buying a house is a big deal, and you should surround yourself with a team of professionals who know what they’re doing. A realtor, in particular, is a huge asset to a buyer. A realtor costs a buyer nothing because their fee is covered by the seller, so if you don’t use a realtor, you’re only hurting yourself. A good realtor will go up to bat for you if anything goes wrong, from house hunting to advice on renovation costs, all the way to the closing table. Let them do the hard work for you and help you negotiate a fair contract for the house you want. The best way to find a realtor that you will work well with is through word of mouth. Ask your friends and family who have already been through the process if they know of a good realtor they can refer. When I used to work in mortgage banking, many people came in so desperate for a house, they didn’t bother to shop around for the best mortgage interest rates. That is such a big mistake. If you can take the time to shop for a car at many different places, you should absolutely take the time to shop your interest rates for your mortgage. Not doing so is foolish and can cost you a lot of money up front through closing costs, and in the long run through interest. You should shop around for homeowner’s insurance, too. Don’t go with the same guy you’ve been with for the last decade or the same person that your parents use. Go with the person who gives you the best rate from a reputable insurance company. Every year after you purchase your home, shop those rates again, because they typically increase every year, even if you didn’t file a claim. A home inspection isn’t required to get a mortgage, so if you opt out of one, then you’re putting a lot of your hard earned money at risk. It’s always best to learn of a home’s potential (and current) problems before the seller hands you those keys. Don’t learn the hard way after a costly, unanticipated repair rips through your emergency fund. A home inspection is the best way to protect yourself from buying a lemon of a house, and only costs a few hundred dollars. That pales in comparison to what a a major repair could cost you down the road. Buying a lemon of a car isn’t a good situation, but buying a lemon of a house could be catastrophic for your finances. Your truth-in-lending statement in your loan documents is the single most important piece of paper in that whole stack of closing papers. That’s because it tells you in plain terms how much you’re going to pay in interest, and in total, over the life of your loan. The numbers on that form can definitely be sobering (and depressing), so it’s important to review it closely to know what you’re getting yourself into. Many of us have been there — falling in love with a beautiful home that we can’t really afford. We lust over the finishes in the kitchen, the fancy neighborhood, and the beautifully manicured lawn until it’s all we can think about. Don’t fall into that trap. No house is worth overextending yourself for and, just like buying a new car, the new house feeling fades over time. Any house you over extend your budget for, no matter how much you think you love it now, will become an unwelcome burden to you down the road. If you see a house online that’s above your original price point, then don’t even go look at it, period. Don’t set yourself up for disaster down the road. An emergency fund for owning your own home is a must. You won’t always see it coming, but things will break and repairs will happen, period. Welcome to owning your own home! Rather than having to put all of those repair charges on credit, have a healthy emergency fund set aside just for this purpose. You won’t have to panic or pay interest. Even if you fall in love with a home that you’ve just viewed, you need to consider the resale value of the property simply because you never know what life is going to hand you. If you intend to live in the property forever, that’s all good and well, but you never know when a job transfer or health problem could force you to move. You might have to put your house on the market whether you want to or not. I ignored the resale value on a property that I fell in love with due to its curb appeal and vintage charm. The first property I ever owned was built in the 1920s and was on a main road (as many older homes are). The school district was terrible, but since I didn’t have a child yet, I didn’t consider it. I also didn’t take into consideration the costly maintenance that comes with owning a vintage home. Fast forward a couple of years and one baby later, and my husband and I wanted out. I didn’t think for a second that we’d be able to sell the house for what we paid for it, but luckily we had a great realtor who had us a solid contract on it within weeks. We consider ourselves lucky that we got out from under that house. Whatever you do, don’t borrow money from your retirement funds to pay for the down payment on your home. Not many circumstances warrant borrowing from your own future to finance a purchase made today, and that includes the down payment on your own home. If you don’t have a down payment today, either see if you can get a different type of loan, or consider postponing your home purchase. It’s important to realize if you can’t save enough money for even a small down payment on a home, then you might not be ready for home ownership after all. If you find yourself in that position, make saving for a future down payment a priority over anything else (like buying a new car), and if it’s important to you, you’ll be ready in no time. If you enjoy renting and having a landlord to fix any problems, then by all means keep on renting. Buying a home isn’t always the right answer for everyone, even though it’s something you may hear about often. Owning a home comes with a lot of financial responsibility as well as a semi-permanent tie to wherever the home is located (or at least until you can sell it). A budget, or at least tracking your spending, is essential to financial success. A well-maintained budget can help you plan for those unforeseen repairs and that mortgage payment, and will also help you determine if you’re even ready to buy a home. A budget can help you get your finances on track, which is important if you’re thinking about buying a home. In addition to having a budget, it’s also a good idea to make sure your consumer debt is paid off first. There’s nothing worse than landing a contract on a great home only to be told by a mortgage lender (or three) that you don’t qualify due to your credit or income history. Getting a pre-approval letter from a reputable mortgage broker is such a quick and easy process – you have no excuse to skip this step. It will also make your offer on a house look much more attractive when the sellers know you’ve already gotten pre-approved, and it can make or break a deal if there are multiple offers on the home you’ve found. In that case, a pre-approval letter will get you ahead of the pack. Now that you’re well-equipped on what to do before looking for a house, let the home buying begin! Have you made any of these common mistakes when buying a home? What would you do differently if you had to go through the process again? What Type of Mortgage Is Best For You? Should You Get a 30 Year or 15 Year Mortgage?